This very popular classic Alpaca cap with visor is designed after the hat Radar O'Reilly wore on sit-com M.A.S.H. 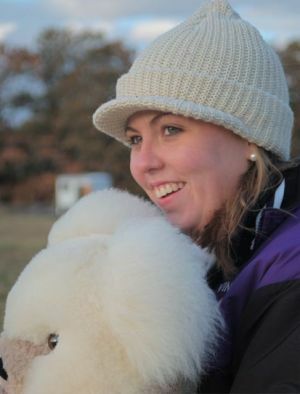 The visor on this Alpaca hat keeps the face better protected in the cold winter months. This ribbed-knit style hat is available in three, all natural colors. For both men and women. Putting our fiber to work - Overview: Island Alpaca contributes half of our annual harvest to a local fiber cooperative which supports not only our farm, but other alpaca farms. Our local fiber cooperative is a processor that pride themselves on producing high-quality alpaca products and maximizing the value of our raw alpaca fiber, so that we can offer, in turn, this high-quality, environmentally and socially conscious alpaca products to the market. At Island Alpaca, we give regular fiber supplements and ground flax daily to our alpaca, helping to promote overall good health and a superior quality fleece. Our alpaca fleece is so fine, that, last year, a large portion of our â€œsecondsâ€� (neck fiber) were re-sorted into the â€œprimeâ€� (blanket) category. Our textile lab has shown results that indicate that our alpaca are some of the finest in the country. At Island Alpaca's annual shearing, we skirt and hand-sort the fleeces in order to produce a range of products which use all grades of fiber. At the cooperative, it is then sorted by color, grade, then hand-baled, scoured, spun and then finally, either machine knit or woven into beautiful, high quality alpaca products. Once the product is received at our Martha's Vineyard farm, they receive the Island Alpaca label and then become available to you for purchasing! We hope you enjoy our product produced by our local fiber cooperative.